Not only are people now taking more medications than ever, but doctors are prescribing more than ever, too. 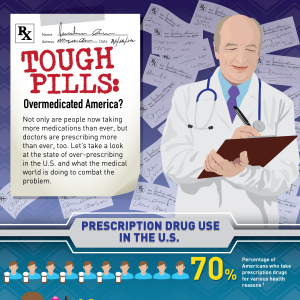 Let’s take a look at the state of over-prescribing in the U.S. and what the medical world is doing to combat the problem. Prescription Drug Use in the U.S. Antibiotics are the most over-prescribed medication in the country. Because of the over-diagnosis of ADHD in children, stimulants like Ritalin are over-prescribed. Many programs are now available to both doctors and pharmacists that help stop the over-prescribing of medication. Though some of these focus mainly on controlled substances, they can be used to track all patient prescriptions and medical history.